Lauderhill Concrete Vent Blocks from Atlantic Coast Precast will not disappoint you. Since starting our business in 1965 we have established a stellar reputation that we work hard to maintain. Our concrete vent blocks are beautiful, and offer protection while still allowing light and air into the area. Our clients love our concrete vent blocks, which are very popular with contractors, designers, architects, engineers, and other industry professionals. Our concrete vent blocks are available in all sizes, shapes, and designs. You will be very pleased with how affordable and easy it is to maintain. 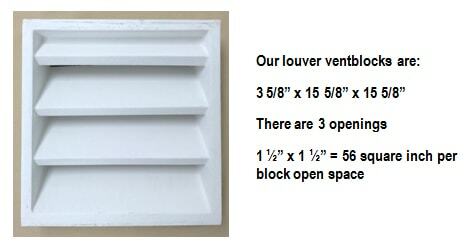 Lauderhill, concrete vent blocks from our company are more affordable than from many of our competitors. Our vent blocks consist of a block and screen which are commonly used in range hoods, foundations, and garages to increase ventilation. It is important to use good foundation vents and exterior vents to help prevent excessive moisture from piling up under your home or other structure. Our vent blocks are reinforced with a galvanized frames so they offer great protection against moisture. You will be very pleased with how long our concrete vent blocks last. Our flawless workmanship, affordable rates, and long-lasting results are a few of the reasons why we are a top choice for so many people. Our Lauderhill concrete vent blocks can make any space more beautiful. Our state-of-the art molds enable us to provide superior quality and excellent detail. Remove musty, moist air with proper ventilation and you will be able to keep away termite infestation and damp rot. With proper ventilation you will be able to keep fresh air circulating properly underneath your structure or home. To hear more about our concrete vent blocks or discuss your specific needs call us today. You will be very happy that you did!